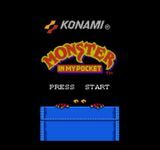 Monster in my Pocket is based on the toy line of the same name released in the 1990s. The collection consisted of hundreds of collectable "pocked sized" monsters. In the video game, the player controls either The Vampire or The Monster. The choice is purely cosmetic, as both characters function exactly the same. The story is that the evil Warlock has sent out his minions, forcing The Vampire and The Monster to fight them to prevent them from taking over. The game spans six stages of old school platforming action, each ending with a boss battle. Controls are basic enough, with the attack button emitting a small energy arc. It is also possible (and quite often necessary) to perform a double jump by pressing the jump button a second time while the character is in the air. The player starts each life with five hit points, losing one every time he is touched by a monster. Small bottles containing hearts are scattered throughout the stages and award one hit point if collected (but never more than the max of five). If all lives are lost you may use a continue to start again at the beginning of the current level. A player is given three continues. If all lives are lost after having used the final continue, your game is over. The level layouts make it obvious that the monsters are indeed "pocket-sized." The player must navigate over radios and kitchen sinks, using keys and screws as weapons. The game can be played with two players, but is not cooperative.